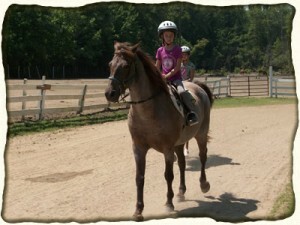 Riding lessons are available from age 6 & up. Contact us for rates and availability. We offer numerous levels of skill instruction. 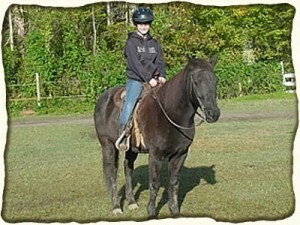 You will begin to learn how to approach, halter, lead, groom, saddle and bridle the horse. You will also learn about horse safety rules, aids and how to use them, mounting and dismounting, the basic seat and reins, and how to walk, trot and whoa the horse. Parts of the horse and tack are also included at this level. As you become more confident in your basic skills you will begin to exercise gaining independence in your aids and seat so that you will become more accomplished in your ability to walk and trot the horse. You will learn to communicate clearly with your horse, thus you are getting ready for the faster gaits. You will learn more about the parts of the horse, the tack and its care. Students should start to develop good hand skills, a better seat, more control and independent use of aids and a better understanding of how they work. You will continue to learn the parts of the horse, care of the horse, and barn management. 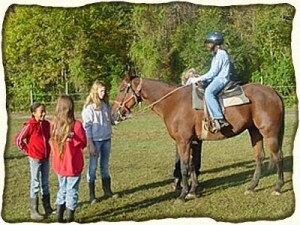 There is so much to learn about our equine friends and so many ways to enjoy them. It is our hope that we would be able to give you a taste of the pleasure that you can obtain from the world of horsemanship.